23-year-old Caucasian female presented to Illinois Retina Associates reporting a large blind spot with resulting poor vision in her right eye since 2016. She had been previously treated with a series of intravitreal injections in the affected eye at a California retina practice. Her left eye is unaffected. Visual acuity is count fingers at 1 ft. in the right eye and 20/20 in the left. IOP is normal in both eyes. Slit lamp examination for the anterior segment is normal bilaterally. Fundus examination is as shown below and is notable for extensive subretinal fibrosis in the right eye as well as angiod streaks emanating from the optic disc in the left eye. There are also characteristic pigment changes temporal to the macula in both posterior poles (Figures 1 & 2). 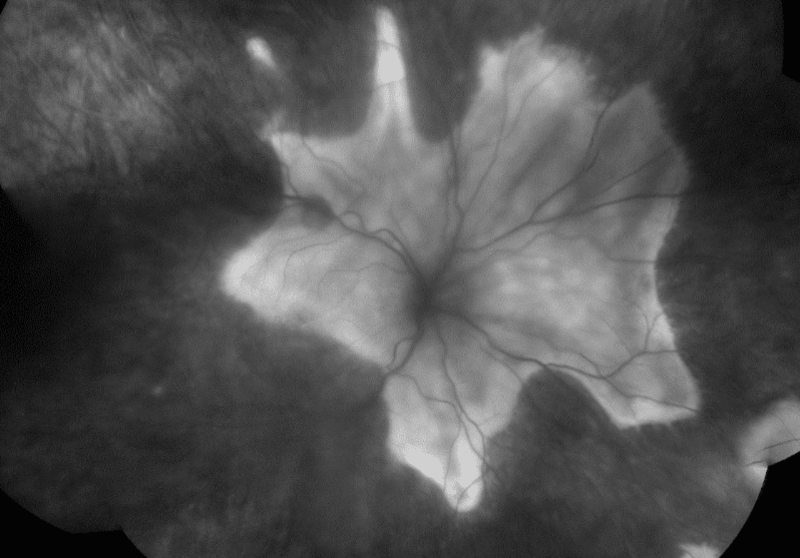 OCT shows extensive subretinal fibrosis with overlying subretinal fluid in the right eye. 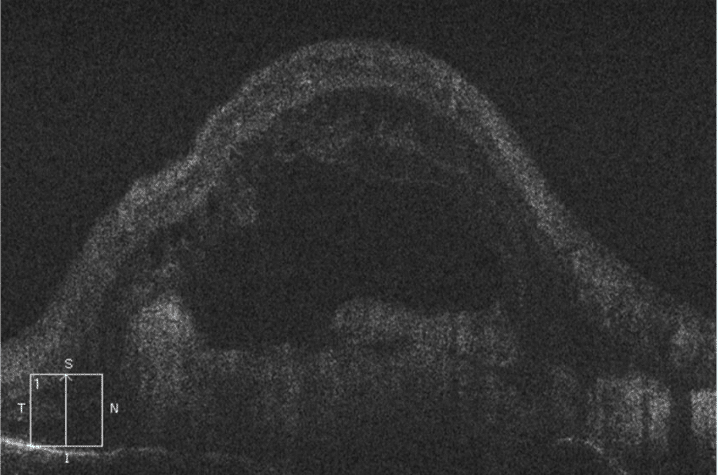 OCT of the left eye is grossly normal (Figure 3). 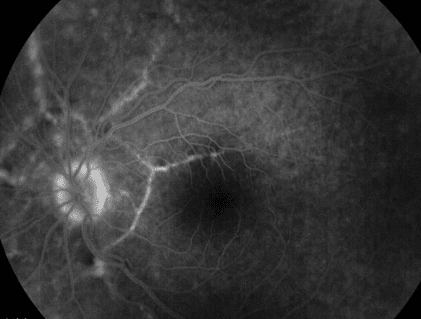 Fluorescein angiogram of the right eye shows extensive late hyperfluorescence consistent with staining of the above-mentioned subretinal fibrosis. There is early hyperfluorescence suggestive of window defect corresponding to the angioid streaks in the left eye fundus (Figures 4 ∓ 5). External Examination of the patient’s head and neck revealed a patch of skin with irregular contour was noted on the back of her neck (Figure 6). Additionally, genetic testing obtained showed that the patient was both ABCC6 and ENPP1 positive. With the presence of angioid streaks emanating from the bilateral optic discs, along with the characteristic RPE changes in the posterior pole and pathognomonic skin findings on the patient’s neck, the patient’s presentation is highly suggestive of pseudoxanthoma elasticum. 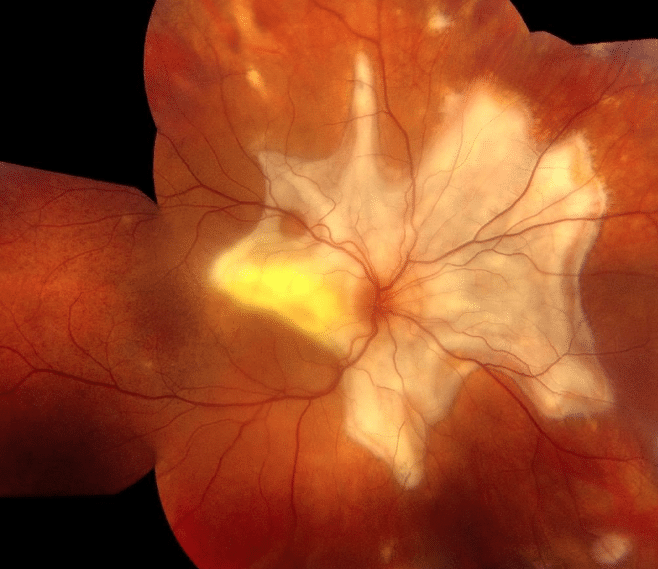 The extensive subretinal fibrosis and history of prior anti-VEGF injections is indicative of previous secondary choroidal neovascularization in the right eye. Pseudoxanthoma elasticum is an inherited disorder, which is associated with accumulation of mineralized and fragmented elastic fibers in the skin, vascular walls, and Bruch’s membrane in the eye. 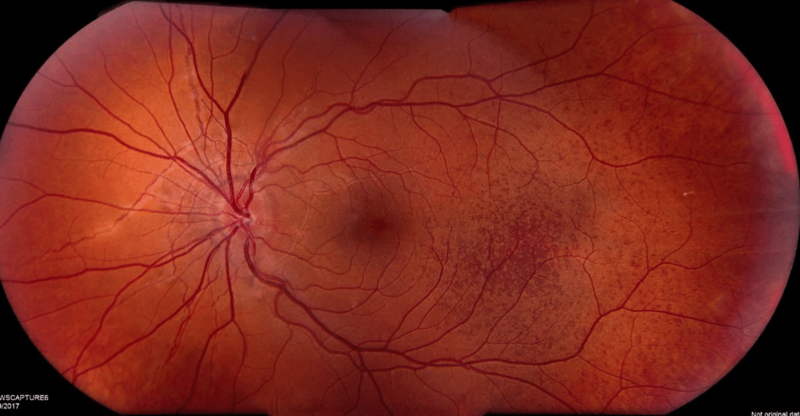 Characteristic lesions of the posterior pole include angioid streaks, peau d’orange fundus, and choroidal neovascularization. 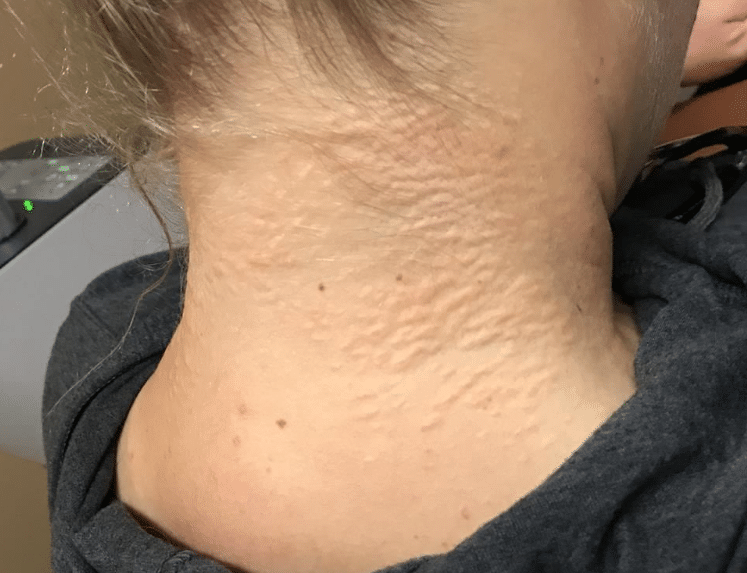 Commonly seen skin lesions are ivory-colored papules in a reticular pattern that are most often noted on the neck and large flexor surfaces. People with this condition also frequently exhibit cardiovascular complications. There is no treatment for the underlying condition, but therapies are generally intended to minimize secondary complications of the disease. Angioid streaks, or breaks in the thickened, calcific Bruch’s membrane eventually allow inward growth of fibrovascular tissue and choroidal neovascularization. End-stages of the disease generally include extensive subretinal fibrosis and disciform scarring, leading to profound visual impairment. Early treatment with anti-VEGF targeting CNV is aimed at preventing scarring, and thus significant visual loss. Finger, R. P., Issa, P. C., Ladewig, M. S., Götting, C., Szliska, C., Scholl, H. P., & Holz, F. G. (2009). Pseudoxanthoma elasticum: genetics, clinical manifestations and therapeutic approaches. Survey of ophthalmology, 54(2), 272-285.